Some of the best toys for kids with autism are toys that help with their ongoing development while also providing a huge fun factor. Fortunately, reputable toys companies are becoming increasingly aware that ASD kids benefit from certain kinds of toys so there are lots of toys on the market today that are great for kids with autism. Like all kids, autistic kids love playing, but sometimes they can find play a bit difficult as they can struggle with copying simple actions, focusing on things, learning to take their turn when playing games, and more. But certain toys can help them develop these skills, while also helping them improve their social and communication skills. Suitable toys for autistic children are toys that help them focus, encourage exploratory play, teach them about cause and effect, give them different types of sensory stimulation, and more. We’ve done our homework so we can present you with some of the most suitable and popular toys for autistic children. We’ve confident that all the toys on our list will not only help aid in their development, but also let them have tons of fun! 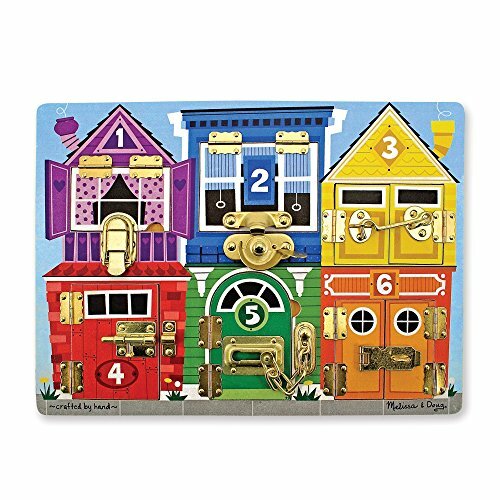 The Melissa & Doug Latches Wooden Activity Board is a great toy to help kids explore various types of locks and how they work. It’s also an ideal way to help them develop their fine motor skills, and learn about colors, counting, and numbers. This activity board can be useful for ASD kids who have delayed fine motor skills and find comfort in repetitive actions, such as opening the doors and the windows and counting objects on this activity board. Some of the locks on this activity board are a bit harder to open than others. This will help improve your child’s focus, as they work on the lock until they’ve master the task. Recommended for kids 3 and up, the board measures 15.5″ X 0.5″ X11.5″ and is made of wood with paper pictures of windows and doors. Parents report that this activity board really seems to hold their child’s interest and is a great toy for them to use during quiet time. It’s an awesome toy that can be helpful for kids with autism and will provide hours of fun for your toddler and preschooler. It’s fun and educational, helping your child learn about colors, numbers, and counting. 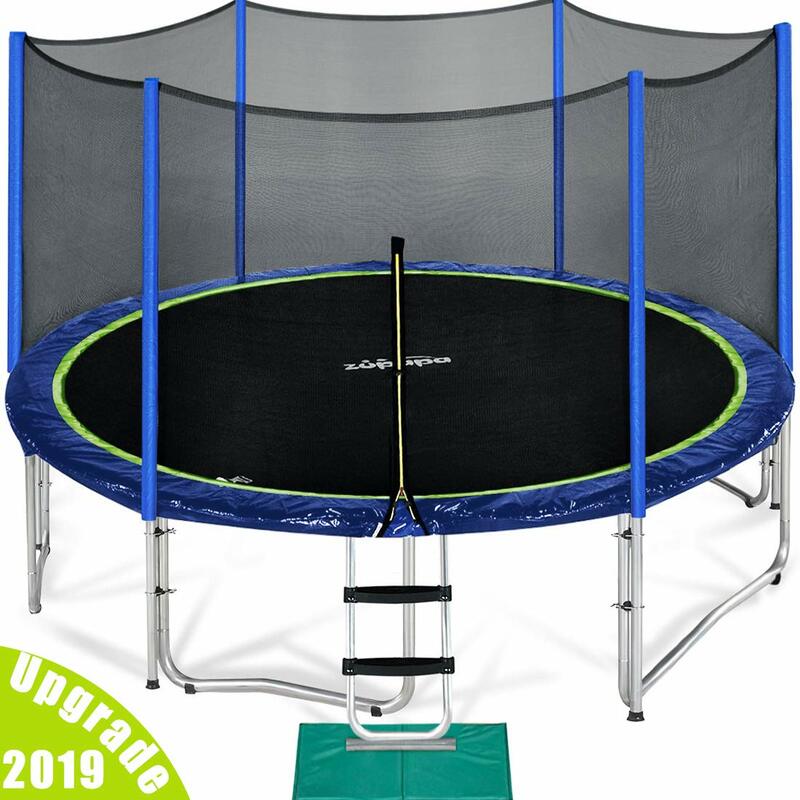 This awesome Zuppa TUV Approved Trampoline With Enclosure Net is a safe and fun toy for the entire family to enjoy! Available in 12, 14 and 15 foot sizes, this trampoline has a heavy duty frame and is designed to have no gap between the jumping area and the spring pad for added safety. Depending on the size of trampoline you buy, it can hold anywhere from 330 to 375 pounds of weight, making it ideal for adults as well as kids. In addition to the trampoline, you’ll also get a ladder, the net, a rain cover, T-hooks, wind stakes, and gloves for installation. It also comes with a 10 year warranty on the frame, and a 2 year warranty on the safety net, springs, and mat. However, it doesn’t come with grounding stakes, which you may want to purchase separately if high wind conditions are a concern in your area. Also, some parents suggest that you get the inside protection net for extra protection against the spring pad, which is a bit hard. Although assembly is required and is somewhat time consuming, parents state it’s time well spent as their kids get years of use out of this Zuppa trampoline. Trampolines are great activity for some ASD kids as the repetitive bouncing is somewhat comforting to them, and they like that the air rushing past them as they’re jumping provides them with tactile stimulation. This trampoline will provide your child with hours of fun! 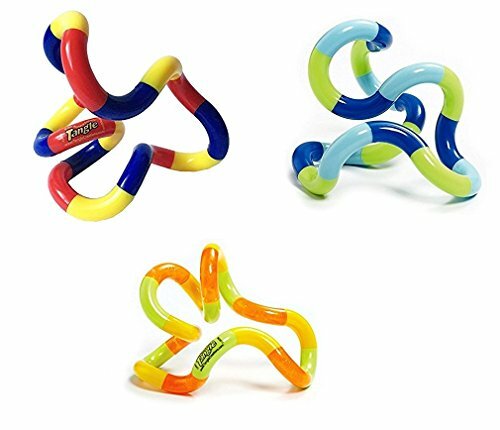 This Tangle Jr. Classic Fidget Toy comes in a pack of three and is the perfect toy for kids who need to keep their hands busy or who suffer from anxiety or stress. These little fidget toys can be taken apart and put back together and the pieces can be interchanged or made into one larger fidget. They also can simply be twisted into all kinds of different shapes, which kids really enjoy doing. Fidgets are quiet time toys and have been credited with helping kids focus and concentrate in school, and preventing nervous behaviors, such as picking at their cuticles. For ASD kids, fidgets can provide some sensory stimulate and help ease some the anxiety they feel when they are put into new and unfamiliar situations. Because these fidget toys have small pieces when they’re taken apart, the recommended age is 3 and up. Many adults find these fidget toys just as calming as kids do. This pack of three is great for sharing with friends and siblings. It also allows your child to keep one at school, one at home, and one in the car when traveling so they always have one available when they need to keep their hands busy or relieve stress. This 24 piece Skoolzy Jumbo Nuts And Bolts Set is a unique and fun toy that most young kids will love. A wonderful Occupational Therapy toy, the pieces come in 4 shapes and 6 colors, including red, orange, yellow, purple, green, and blue. Made from non toxic, BPA free, lead free, and Phthalates free material, these oversize nuts and bolts are large and easy to grasp. Plus they come with a handy drawstring backpack that makes storage and transport easy. While screwing and unscrewing these nuts and bolts provides hours of fun for your child, these nuts and bolts can also help with color recognition, sorting, shape recognition, and counting. This set is also a great way to help improve your child’s fine motor skills, hand-eye coordination, dexterity, and problem solving, as not every nut fits onto every bolt. This Skoolzy toy is good for ASD kids who find repetitive tasks comforting. It may also make it easier for an autistic child to communicate and spend time with others. Although recommended for kids 3 and up, many parents find this toy suitable for kids as young as 18 months. 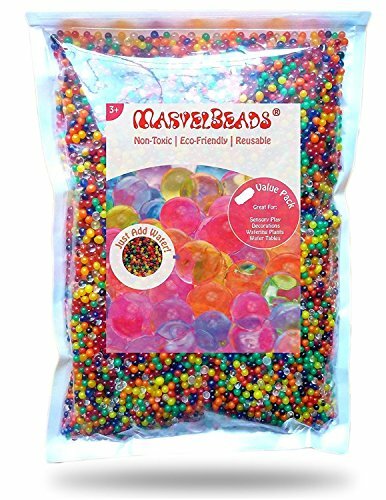 If you’re looking for an awesome sensory toy for an autistic child, this 8 ounce package of MarvelBeads Water Beads Rainbow Mix may well fit the bill. Water beads can be especially enjoyable for kids with autism. Their smooth and squishy feel provides tactile stimulation which can soothe some ASD kids and help them relax. Kids love that these colorful water beads magically grow right before their eyes, starting out tiny and growing larger within a few hours. They’re ideal to use in the bathtub, a kiddie pool, a water table, and many more places. Because all you need is water in some kind of container, the possibilities are endless. Parents like that these beads are reusable, biodegradable, and in addition to being a wonderful sensory toy, they also make lovely decorations, adding a splash of color and fun to flower vases and centerpieces. Recommended for kids 3 and up, when these water beads dry out kids are amazed that they shrink back down to their original size. These MarvelBeads Water Beads are a great sensory toy that will keep your child happily engaged as they watch them magically transform and grow. This awesome ALEX Active Monkey Balance Board is an ideal way for your child burn off excess energy while helping them improve their balance and motor skills. A fun sensory toy for ASD kids, this balance board can actually be calming for autistic kids and is something they can use to help them focus on other activities. Compact and colorful, the board consists of a platform and 2 side boards and is very easy to assemble. It’s also sturdy and designed to hold weights up to 200 pounds, so even adults can join in the fun. Although the recommended age for using this balance board is age 3 to 7, several parents said that this board has been used by kids as young as 2 and as old as 9. 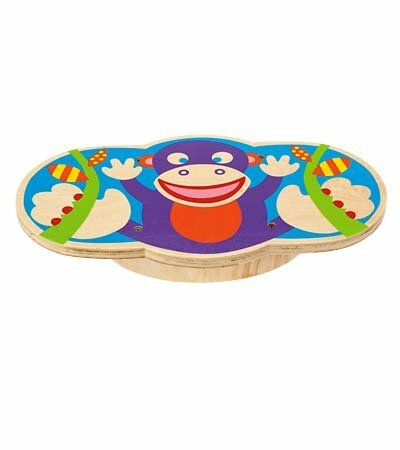 This Monkey Balance Board by ALEX Toys is a fun activity that can aid your autistic child’s development while allowing them to have fun at the same time. Kids find this balance board tons of fun to use! 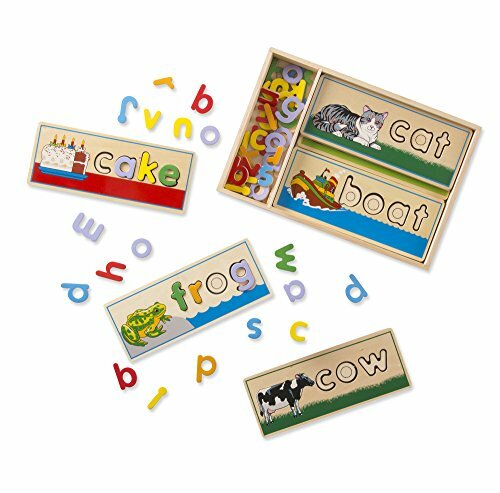 This awesome Melissa & Doug See & Spell Wooden Educational Toy consists of 8 double-sided cut out board word puzzles. All the puzzles are easy to do three or four letter words. In addition to the word itself, each puzzle board also has a lovely picture of the word, giving your child another way to recognize each word. This toy comes with 50+ colorful letters and in addition to using the letters to complete the word puzzles, your child can also use them to spell other words. So these puzzles are a fun way for your child to become familiar with the letters of the alphabet. These puzzles are also a great way to help kids with their color recognition, fine motor skills, beginning spelling skills, and early reading skills. This wooden toy is made from sturdy particleboard and it comes with a wooden tray to keep all of the pieces together, making clean up and storage quick and easy. Although it’s recommended for kids 4 years to 6 years old, many parents state that autistic kids of all ages really enjoy these puzzles and have hours of fun with this toy. This Melissa & Doug educational toy is a wonderful way to encourage an early love of reading. Kinetic Sand is a great alternative to Play Doh and it’s much easier to clean up! This 2 lb box of brown kinetic sand is a mixture of sand and polymer and kids love playing with it. Not only does this unique sand stick to itself, it’s also easy to form into shapes and just as easy to break back down into sand. It’s non-toxic, doesn’t dry out, and clean up is quick and easy because the sand particles stick to each other and not to whatever surface your child is playing on. Kinetic sand is a wonderful sensory toy and playing with it can be very soothing and calming, which makes it an ideal toy for many autistic kids. Recommended for kids 3 and up, it can be used with small molds (sold separately) and is a great way for your child to explore their artistic side. Kids really enjoy playing with kinetic sand! 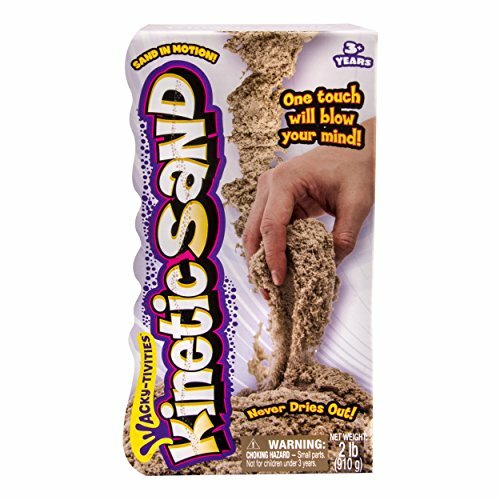 Fun for kids of all ages; even adults enjoy playing with this sand! This awesome Educational Insights Playfoam Combo Pack is a wonderful way to to encourage your young child’s creative and artistic side! Everything in the Playfoam Combo Pack is non-toxic and it comes with 20 pods in a variety of colors, including blue, purple, orange, pink, yellow, green, and peach. Kids love that Playfoam is squishy and easy to form in different shapes. And each pod is about an ounce, so there is plenty of Playfoam to keep your child happily creating. If your child mixes the colors in this combo pack, the initial colors of the foam remain, so the mixture becomes kind of a pretty pastel rainbow color instead of one muddy color. Easy to clean up, this Playfoam is recommended for kids 2 to 8 years old, but parents find that older children also like working with it. Playfoam is an excellent sensory toy for ASD kids, and parents find that these small pods make great favors for children’s parties, as well as fillers for stockings at Christmas or Easter baskets at Easter. 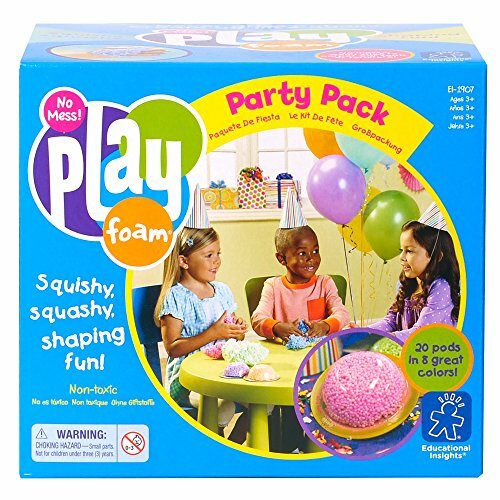 Kids love playing and creating with this foam! 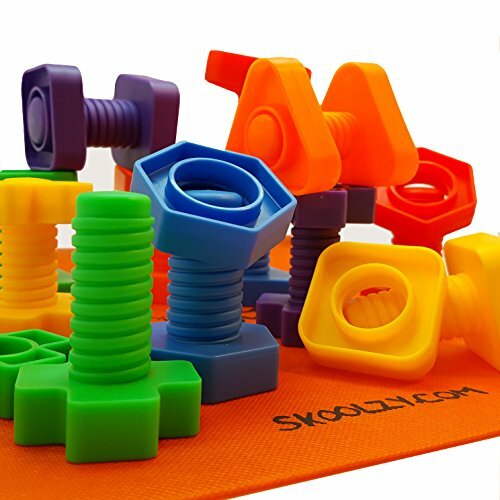 The Skoolzy Peg Board set is a colorful and fun toy that allows your toddler or preschooler to learn as they play. This set comes with a rigid foam peg board (which holds 25 pegs), and 30 plastic pegs; 5 each of red, yellow, orange, green, blue, and purple. There’s also a handy storage bag to keep the board and all of the pegs together after playtime is over. The Skoolzy peg board is a great toy to help your child learn color recognition, sorting, and counting. It can also help with early math skills such as making simple patterns, addition and subtraction. For even more fun, the pegs can be stacked on top of each other to build towers. This peg board set is non-toxic and is BPA, lead, and Phthalates free, and it comes with an activity guide. Your child can play with the peg board alone, but it’s also great for parent/child time, as you can help them with their color recognition, counting, sorting, and early math. Parents of autistic kids say that this peg board is a wonderful and engaging sensory toy for their autistic child. 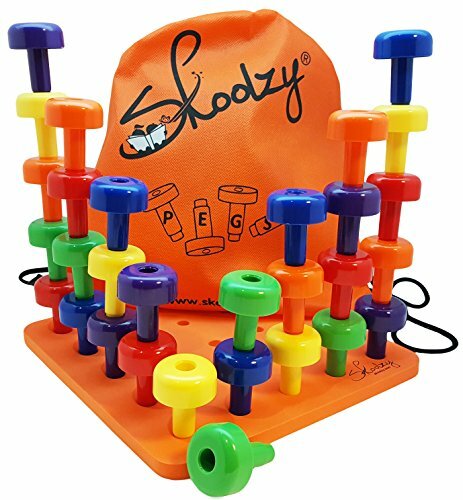 The Skoolzy Peg Board set is a great toy for helping your child develop a number of skills while having a great time playing. Young kids think this peg board is tons of fun to play with! Educational toys for young children should be fun and provide a variety of ways to play, which is exactly what this Melissa & Doug Shapes Wooden Chunky Puzzle does. The puzzle has eight brightly colored pieces and each individual puzzle piece stands up on its own. It’s a great way to help your child learn color recognition, and counting. 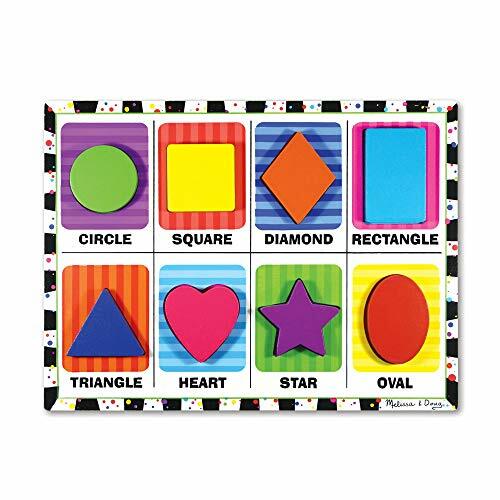 This awesome puzzle features shapes such as circles, square, rectangle, star, diamond, triangle and oval, so it can also help teach your child to identify different shapes. Each piece is made from wood, so your little one can trace around each shape, which will help them develop their find motor skills and provide them with another way to play. Puzzles are a great way for kids to develop their hand-eye coordination, and they’re an excellent way to build the attention span of autistic kids. While this puzzle is excellent for solitary play, it also provides a wonderful opportunity for quality interaction between parents and kids. Although this puzzle is recommended for kids 2 to 4 years old, some parents state it makes a fun early learning toy for children as young as 18 months. The Melissa And Doug Shapes Wooden Chunky Puzzle is a great beginner puzzle for toddlers and offers them multiple ways to play. Kids think this puzzle is lots of fun to play with! If you’re looking for a simple toy that’s fun, educational, and provides your child with great sensory stimulation, then check out the Hansen M1301 Rainbow Hoberman Mini Sphere. By simply grabbing one of the plastic points, you can make it expand up to 12 inches. And when you touch it in a certain way, you can ‘magically’ shrink it back down to 5.5 inches. How cool is that! It can also be thrown, caught, kicked, and spun, so there are lots of great ways your child can play with it. And it’s well made and durable enough to last for many hours of playtime. While this sphere is simple and fun for your child to play with, it can also help improve fine motor skills, plus it’s a great way to relieve stress and learn about physics. Many parents who have a child with autism state that this mini sphere absolutely fascinates them for long periods of time and helps to calm their anxiety. 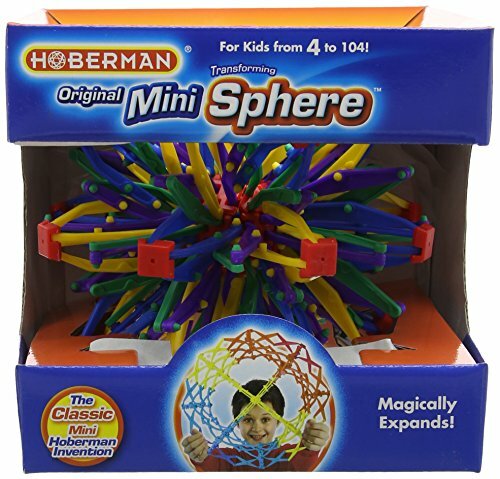 Recommended for kids 3 years and up, the Hoberman mini sphere comes with a trick booklet so older kids can enjoy playing with it too. The Skoolzy Rainbow Counting Bears with Matching Sorting Cups is a fun and educational toy for toddlers and preschoolers. It offers a number of activities for your child, including color recognition, (bears are red, orange, yellow, green, blue, violet) sorting, (the bears come with matching colored cups) counting, addition, subtraction, pattern recognition, and more. Stacking the cups is also a great way to help improve your child’s fine motor skills and hand-eye coordination. An ideal sensory toy for ASD kids, this Skoolzy set comes with a dice and each side of the dice has a different color bear on it, giving your child even more ways to play and learn. Plus, it also comes with an email that gives you access to a free pdf with details for additional activities. Kids love the vibrant colors and all 70 pieces of this set are non-toxic, BPA free, lead free, and Phthalates free. They’re also washable and extremely durable. The set comes with a separate container that has a lid and that, together with the fact that the cups are stackable, makes clean up a breeze. These rainbow counting bears are recommended for kids 2 years old and up. They’re great for homeschooling parents and a wonderful way for you to spend quality time with your child, as there are lots of different ways to play with this awesome set. 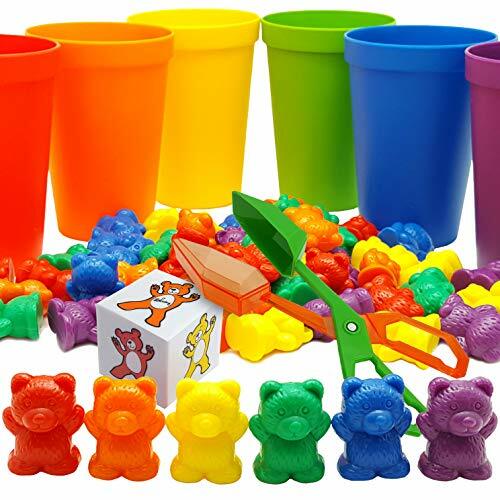 This Skoolzy Rainbow Counting Bears and Matching Sorting Cups set is a fun toy that offers your child a number of ways to play and learn at the same time! Kids think these colorful bears are tons of fun to play with!